Trench T, clearly showing the rubble “collar” between the two revetments. Okay, we have to admit it. Over the past few days there has been a tendency to stifle a yawn when Trench T is mentioned. Those vast, empty acres of midden interspersed by diggers and yet more midden. Is this really Britain’s biggest prehistoric midden mound? Do we care? For Trench T has suddenly burst into the consciousness of everyone on site. Site director Nick’s tour of the Ness this morning brought us, feet dragging and bowed into the wind and rain, up to the trench edge of T. It looks much as it has for the past few days, but trench supervisor Ben had some radical new thinking to impart. Yes, we still have the midden mound (definitely Neolithic), but we also have two roughly parallel revetment walls, the lower one facing uphill on the slope and the upper one facing downhill. Are these revetments on either side of a ditch that has been cut into the slope of the mound? If so, they are strongly reminiscent of the revetted ditches of (dare we speak its name) the Iron Age! This would make the rubble “collar” between them ditch fill. Don’t forget, we have a few fragments of iron from the quarrying/stone robbing pit discovered last year, high up among the rubble on the other side of the trench. 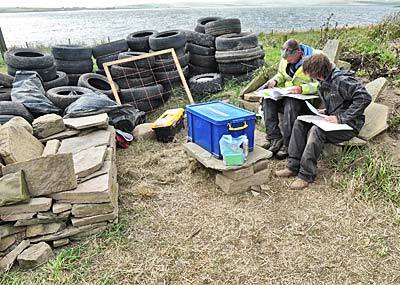 All of this has brought the site of Roundhowe, in Tankerness, Orkney, to Nick’s mind. He co-directed the Iron Age site of Minehowe and, while there, investigated Roundhowe. 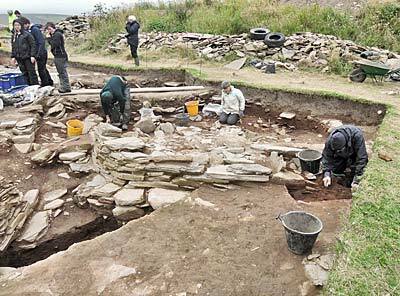 This showed all the signs of being a ditched, Iron Age enclosure, surrounding a broch (large Iron Age tower structure) but, apart from a few sherds of pot, it was almost devoid of artefacts – not typical of broch sites. It may well have been, instead, a type of non-broch broch or, to put it simply, a non-domestic broch with ritual overtones. There is now a possibility (nothing more so far) that Trench T may represent the total remodelling of an earlier and possibly Neolithic structure in the Iron Age. This is not a novel occurrence in Orkney and sites such as Quanterness, Rowiegar and Howe spring to mind. Perhaps what we may even have is an Iron Age structure sitting on top of the earlier structure. After all, we are only 200 metres or so from the putative Iron Age broch of Big Howe. Fortunately, bone has been recovered from the rubble “collar” and this will be sent for Carbon 14 dating which may help to resolve the matter. In the meantime, the investigation of these strange features continues. Structure Twenty-one takes shape with the removal of robbing debris from its interior. Further excavation of the relatively small remnants of Structure Twenty-one, just outside Structure One, are taking place. Geophysics suggests that the structure disappears under our very large spoil heap, but what has been revealed thus far is typical of the other piered structures, which cluster around Structure One. Indeed Structure One continues to be stratigraphically a little earlier than all of the other structures in the vicinity, and its beautiful stonework, erect walls and magnificent secondary hearth all confirm its apparently primary position and early date in this phase of the site. In Structure Twelve, Mic continues to remove his very large spread of Grooved Ware pottery. He assures us it will all be recovered in the next two days, but only if the current context he is working on does not hide another spread of pottery underneath. Structure Twelve’s stone age home-from-home, complete with seats, sofa and a table. Just a few yards away, in the north-east side recess, Seb is investigating the area around the stone box and is discovering numerous cobble stones. Some of them are partially worked and one looks like a roughout for the stone cubes with concave and flat sides which have already been found on site. These have been interpreted as small working platforms which can be held between the knees with one’s knees fitting neatly into the concave sides. Interestingly, Professor Mark Edmonds had suggested, a few minutes earlier, that the relative lack of Skaill knives on site (flakes of stone struck from beach cobbles and used as throwaway blades) could probably be explained by our distance from any seaside beach. It now looks as if someone had made a trip to the seaside to collect beach cobbles for the tasks which Seb’s excavation is now unveiling. Still in Structure Twelve, Natasha is excavating a pit which contains pottery and which is close to a drain which appears to run to the exterior wall of the structure. Is it really a pot, or is it a potty? Only time, and tomorrow, will tell. “Cobblestone Corner” in Structure Twelve. Hi, my name is Raeanna Wood. I’m a student of archaeology studying at the University of Evansville in Indiana, and I’m from Sitka, Alaska. 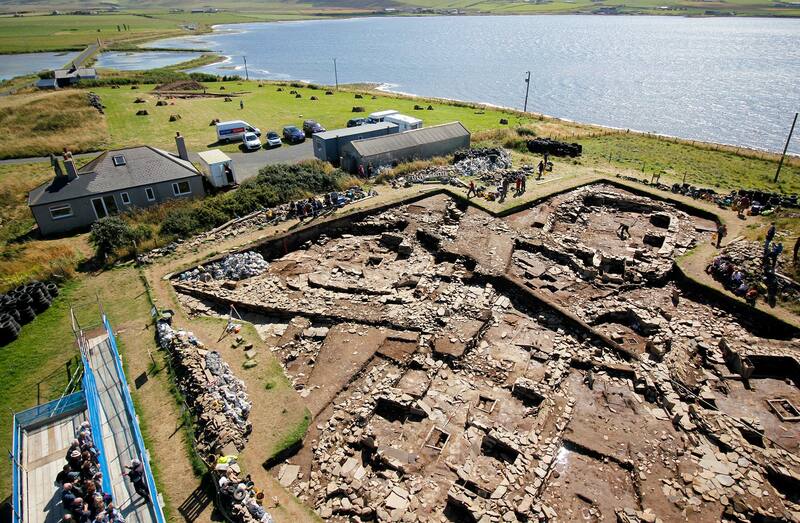 I first got interested in the Neolithic archaeology of Orkney because of a documentary I once saw on Skara Brae. I was fascinated by the way the Neolithic people dealt with the unique difficulties of their surroundings, as well as by the distinctive architecture and layout of their houses. 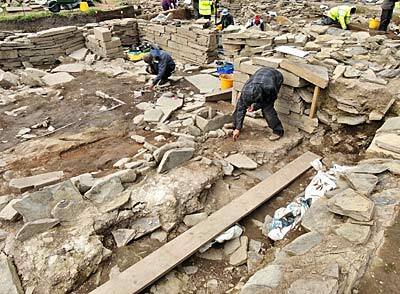 When I began looking for a field school, therefore, I thought it would be an absolute dream to excavate in the same region as Skara Brae. 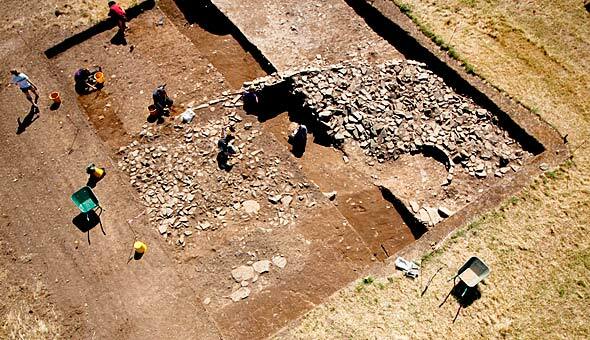 Research then led me to find the Ness of Brodgar, a site that has more than exceeded my expectations. With the rest of the field school students from Willamette, I’ve been assigned to Trench T. Believed to be a burial mound; I’ve been working to clear the rubble that’s stacked behind the uncovered wall. Over the last few days, our efforts have begun to expose the continued sections of that wall. Incidentally, however, we took pictures today of the wall and trench because the wall is going to be removed soon to allow further excavation. The weather has been atrocious to work in today. The wind has not let up and it’s been raining on and off. When taking the pictures, our trench supervisor had to get up on a really tall ladder. But since we were all worried that he’d be blown off, there were no less than six or seven of us huddled around the base of the ladder trying to stabilize it. I’m sad to see the beautiful wall go, but it must be done in order to see what’s beneath it, and therefore what pre-dates it.